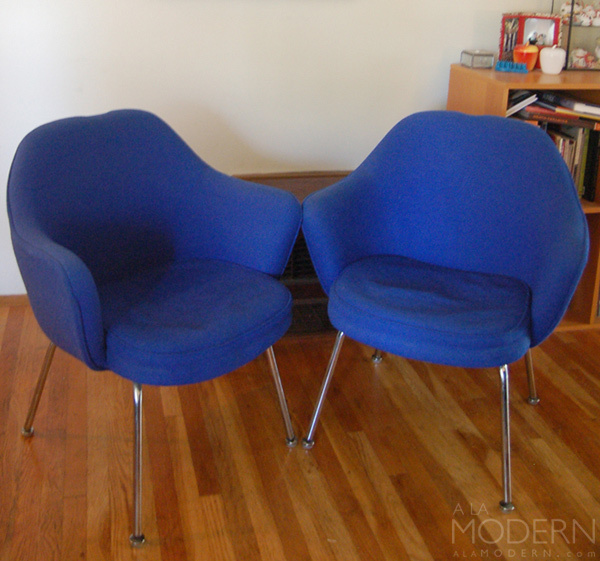 I know I said we had a lot going on this weekend, but just had to post up these great Knoll office chairs we found that I believe are designed by Eero Saarinen. We had a few minutes to stop by the local Salvation Army. I rarely find anything there, so my jaw just about dropped off when I saw the pair of these sitting there. Even better, it was 50% off day! They have the original Knoll tags, and the date stamp on that is from 1971. We're very curious about this line, especially since we're not as familiar with Knoll stuff. The chairs do not have the open "hole" in the back that we see on most similar chairs (series 71-72?) Anyone know more about this particular line? I believe they must be less common than the standard ones, because we haven't been able to find many like these online.